God has just unveiled His latest cruel and unforgiving smiting technique to the world. 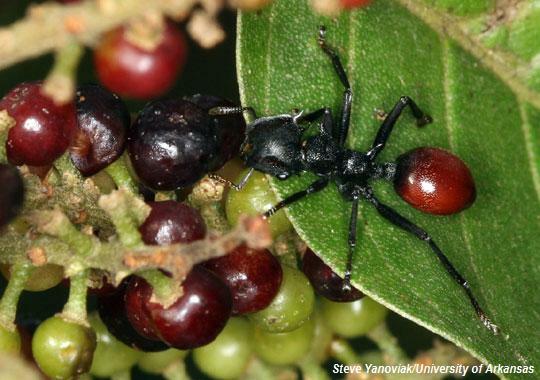 Far away in Central and South America, the black ant community has made the unfortunate discovery that its brothers and sisters are turning into fruit. Or at least it appears that way, and the birds preying on them don’t seem to notice the difference. The cause is a tiny parasitic nematode (more commonly known as a roundworm) that has found refuge inside the ants’ bodies. In a twist of fate, the the ants black exoskeleton becomes increasingly translucent revealing the red and shiny layer beneath, almost perfectly mimicking the red berries found in their natural habitat. What the black ants might have done to deserve such a bitter fate remains undetermined. Regardless, no one can deny the parasites’ antics are disturbingly human-like in their mercilessness. Perhaps even more disturbing and more noticeably human than their desire to live at the expense of others is the complexity of the parasites’ overall plan. After causing the ants to morph into a berry delights that are eating by birds, their eggs proceed through the birds digestive system unharmed and back out into the unknowing world freshly fertilized and ready to attack when an unsuspecting ant victim comes too near. We must remind ourselves how small these creatures are and how very limited their perception of their environment is. It is borderline inspirational that such simple organisms can contrive in such sadistic ways. It almost makes us question whether other intelligent life already exists in our universe, and we’re simply overlooking it because it’s on our own planet.